External structure in hot-dip galvanised steel, anti-corrosion treated and white PVC film coated. Scotch-Brite stainless steel internal structure. 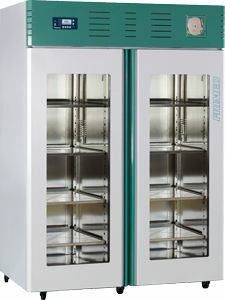 Two self-closing glass doors (double insulating - low emissivity glass) with folding magnetic gasket on four sides for perfect closing. Right and left hand opening. Two locks with key. LED light (energy saving up to 70%, ecological) with automatic switch at door opening. Manual switch on control panel. 8 shelves in Scotch-Brite stainless steel. Adjustable in height. Setting between +2°C and +12° C. Factory preset to + 4°C. Digital adjustable. Completely sealed, silent and highly efficient hermetic compressor and ventilated air condenser (suitable also for tropical countries). Internal ventilated evaporator. 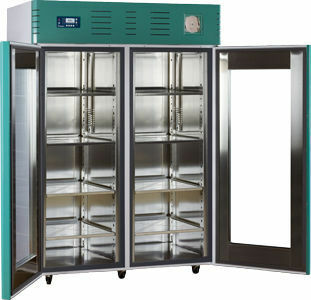 This system forcing air circulation ensures to provide uniform temperature inside the refrigerator. Evaporator fan shuts off during door openings. CFC-free refrigerant. Fully automatic defrosting cycle and auto-evaporation of condensed water.